The town was once part of the JA Ranch (see Goodnight) until the ranch was split up in 1887. Robert E. Montgomery, landowner took advantage of a site that was briefly the terminus for the Fort Worth and Denver City Railway. A townsite was platted and Montgomery named the town for D. W. Washburn, a railroad officer. Perhaps because of his act, the railroad dug two water wells and built a depot and section house. When tracks were laid (1888) to the town of Panhandle (Carson County), Washburn became a boom town - becoming a hub of activity. A post office was granted that year and a combination school / church was built a year later. In 1890 Washburn and Claude competed for the Armstrong county seat. Washburn lost the election. 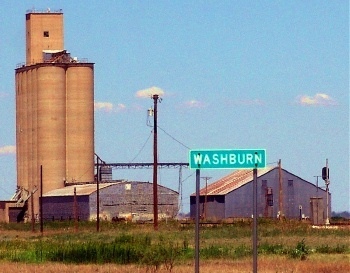 Between it's proximity to Amarillo and it's lost status, Washburn fell into an immediate decline. The town may have been down, but it wasn't out. 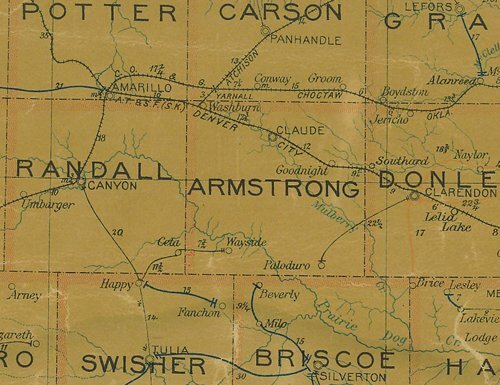 They received a telephone connection to Amarillo in the mid-1890s 1896 and a bank was established and a church built. The population remained at just 25 people for decades - from the 30s through the 50s - the decade when the post office closed. By the mid 1960s it had increased to an estimated 100 people but declined to 70 not long after. Today the town is marked by the grain elevator - but not much else. Planned by R. E. Montgomery, son-in-law of Fort Worth & Denver City Railway Builder-President Gen. G. M. Dodge. Named for family friend. Promoted 1887, Washburn for a time was F.W. & D.C. Line's terminus. It had first newspaper on Plains-- "Armstrong County Record". Also had general store, lumber yard, 2 hotels, 2 saloons. Became junction point, branch line connecting F.W. & D.C. with Santa Fe Railway at Panhandle. Remaining as town dwindled: Judge Jas. Logue, donor cemetery site and founder Washburn State Bank, 1908; H. E. White, owner of store, lumber yard and elevators.